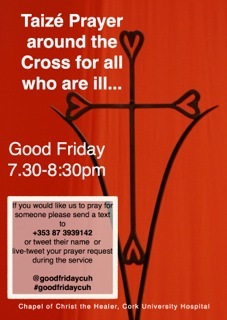 there will be an ecumenical ‘Service of Prayer around the Cross’ in the Chapel of Christ the Healer at Cork University Hospital. In addition to being broadcast on Hospital Radio CUH102FM, this year there will be an open invitation for people outside the hospital to share in this prayer through social media and SMS text. This entry was posted in Chaplaincies, Church in Society, Church Services, Diocese, Holy Week, Pastoral, Prayers. Bookmark the permalink.